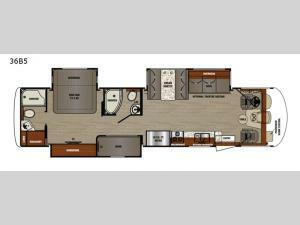 If you are looking to take the whole family on a road trip, then let this 36B5 Georgetown 5 Series class A gas motorhome by Forest River answer your call. This model is one of the more family-friendly models on the market with two full bathrooms and sleeping space for seven people. In the bedroom there is a king bed, and across the room you can watch a movie or your favorite show on the 32" LED TV. Your kids will enjoy their own space with the bunk beds too. The front living area is a nice place to plan out your day of fun and adventure. Here you will find a sofa and a Dream Dinette which both easily convert into additional sleeping space. If mom or dad have a little computer work to catch up on while you are away from home, then the passenger work station is sure to be a favorite spot!